The cast and crew of Doctor Who discuss plans for the next companion. Get a glimpse of Black Panther in action in Civil War. Supergirl casts another DC villain. Plus, looks at the midseason finales for Agents of SHIELD and Arrow, and new images from the Doctor Who Christmas special. So many spoilers! The implication there is that, at some point, Rey and Kylo Ren will engage in a lightsaber duel. Bear in mind that was never really unlikely—there was, and still is, plenty of talk that Rey will become a Jedi-in-training by the film’s climax, and we already knew that she is present during the fight between Ren and Finn. Plus, considering the team running the Star Wars Twitter account didn’t immediately delete Ford’s tweet and cart him off for a swift talking to, it’s likely that it’s not something that was meant to be kept ultra-secret in the first place. 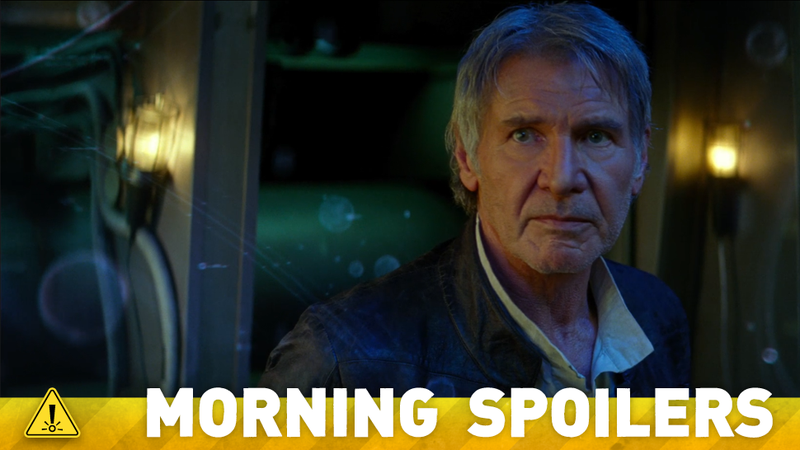 Lawrence Kasdan relates how different the following Star Wars films will be in comparison to The Force Awakens. With the best will in the world, I don’t want a bloke, because I’m frightened that they’ll give him all the action and I’ll be standing around spouting scientific gobbledygook... ‘Oh, Peter’s not up to chasing those Zygons down the corridor, let the chap do it.’ And that would be awful. I want to chase the Zygons! I’m beginning to have an idea of the kind of person, specific ideas but not a specific actress. A new companion gives us the chance to launch the show again. It began in 1963 with the story of Ian and Barbara and then in 2005 with Rose Tyler. Arguably it begins again with the story of Amy Pond. You can recruit new viewers when somebody else meets the Doctor. And I think we’ve got a really cool new idea about how to do that. So it would be a new person. Yeah but anything can change. Would the dynamic of male and female companions work with Peter’s Doctor? That’s still being discussed. We’re definitely looking for a different dynamic. The BBC has released a new trailer for the impending Christmas special, “The Husbands of River Song”. Here’s a new trailer for the midseason finale, “Dark Waters”. Team SHIELD plane a rescue mission, and Simmons confront Malick in two new clips from the midseason finale, “Maveth”.